Pessimism begets cynicism. I know, it’s a strange sentiment with which to begin a CD review. My pessimism results from the retreat of physical music media in favor of digital media, from whatever sources. 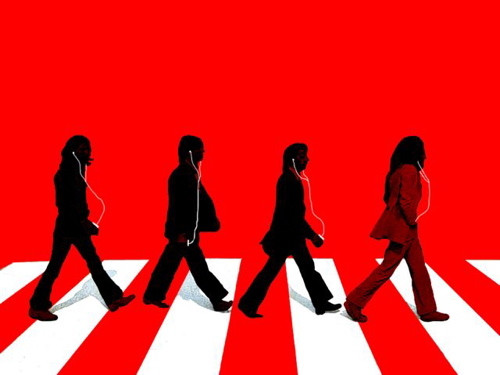 Apple announced today, after years of negotiations, that they would begin selling The Beatles’ songs through i-Tunes. I suppose that’s a good thing. ….before they go the way of the 8-track tape. Which brings us to Paul McCartney, who recently re-released Band on the Run, his 1973 album now digitally picked apart and rebuilt with the same meticulous care recently given to the work of his previous band. For those that have an earlier CD version, is it worth buying a new copy? Well, if you’re a McCartney fan, the answer is “yes.” Whether you buy “just” the remastered album, the Deluxe edition (extra CD and DVD), or the box set (a book and other goodies), there’s enough to whet your appetite varying with your desire to part with money. If you like his songs but haven’t tried one of his albums, again “yes.” If you’re in any other category… of course not. Those who have compared the new CD to the remastered 25th anniversary edition generally give this version an edge. Whether it’s a noticeable one depends upon the equipment that you play it upon and how closely you listen. I have an earlier release from when it was first converted to CD, and the sound is vastly improved. Each of the instruments is more vibrant with fuller, richer sounds. As expected. And I’m very pleased. But, I can’t let the opportunity pass to comment on the contents themselves, as was an album that I frequently played, which may not seem like much, but I had plenty of options from which to choose. Much has been written around the circumstances of the recording of Band on the Run(recorded in Nigeria, the drummer and lead guitarist quit before the recordings, the demo tapes were stolen…), and it seems that whenever someone mentions this album as McCartney’s finest hour, these factors are pulled into the equation… overcoming adversity, that kind of thing. Well enough. The fact was that George Harrison and Ringo Starr were having more commercial success than either Lennon or McCartney after the Beatles ceased, the latter of which were handling their post-Beatles careers differently. Lennon was political and bitter, and McCartney was lacking a partner or a band to give him honest feedback and save him from his saccharine tendencies. He retreated from fame, and he underwhelmed. His initial release, McCartney, was an intentionally informal affair with the outstanding “Maybe I’m Amazed,” the very good “Every Night,” and a couple of nice tunes. RAM was a fully produced affair, but one which didn’t satisfy expectations for hit songs (but one which I’m very much looking forward to in remastered format). Wild Life was the first Paul McCartney and Wings album, and although it does have its charm, it remains a footnote in his catalogue (one critic called it “an audition”). Red Rose Speedway featured the syrupy #1 hit “My Love” and elsewhere had an abundance of tunefulness, McCartney stressing his vocal chords in all the right ways, and some of the worst lyrics ever heard from a major songwriter. Band on the Run, then, finally met public expectations with three hit songs, strong vocals, and passable to good lyrics. It remains a prime example of why I fear the loss of albums in favor of “single” downloads. Radio stations, back when they had DJs who played what they wanted rather than what they were told to play, often had “deep cut” hours when they would play the gems that were never intended for radio airplay. Band on the Road is loaded with these. It’s one of those albums where the listener grows in affection for the “other” songs or the entirety as a set. “Mrs. Vanderbilt,” surprisingly played on McCartney’s recent tours, packs a great tune, “Let Me Roll It” is a slow rocker, and “Bluebird” is a less poetic but worthwhile cousin to “Blackbird.” The only suspect lyrical casualty might be “Mamunia,” but despite it’s title (an African word? Or nonsense? ), the song is good and is a favorite of many. To be honest, I have a hard time picking between Helen Wheels and Nineteen Hundred and Eighty Five. HW is just a lively song and fun to listen to. But I do marvel on McCartney's abilities on 1985. I typically play the whole thing through but hit skip song on Bluebird (I'll take Blackbird thank you!) and Mamunia (WT youknowwhat). That song is just out of sync with the rest of the album. But yes, it deserves 5 stars. One of my most played single albums outside of Dark Side of the Moon or Who's Next.